Guests are met in Paris and transferred by private chauffeured minibus to La Nouvelle Etoile moored in the heart of the Fontainebleau forest. After a champagne welcome perhaps take a stroll through the medieval walled town of Moret-sur-Loing, known to many as the home of the famous Impressionist painter, Alfred Sisley. Tonight enjoy your first gourmet dinner on board. Today, we begin our cruise into the Upper Loire region. Affectionately known as the "Garden of Paris", this little known region gently reveals its secrets. After lunch, we visit the Château de Fontainebleau. To walk through this palace is to walk through the history of France where each French Royal Family added its own architectural style and features when in residence. On our drive back to the barge we may visit the artist community of Barbizon. We moor for the night in Nemours. Dinner on board. 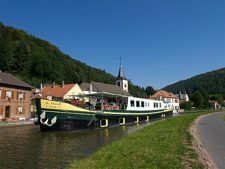 Today, we have a full day cruise to Montargis with plenty of opportunity to bicycle or walk along the towpath of the canal. After lunch we visit this charming town, also called "the Little Venice of the Gatinais" because of its numerous canals. Visit one of the many museums, or shop at the famous Mazet Praline shop with its exquisitely packaged delicacies. Dinner on board. After breakfast, we set off on a leisurely cruise to the charming village of Châtillon Coligny. This afternoon, we take a drive out to the splendid 16th century Château de Saint Fargeau, which is over 1,000 years old and probably the most important place of historical interest in this unspoilt rural region, the Puisaye. Later, in the evening, there is time to stroll around the ramparts surrounding Châtillon-Coligny. Dinner on board. 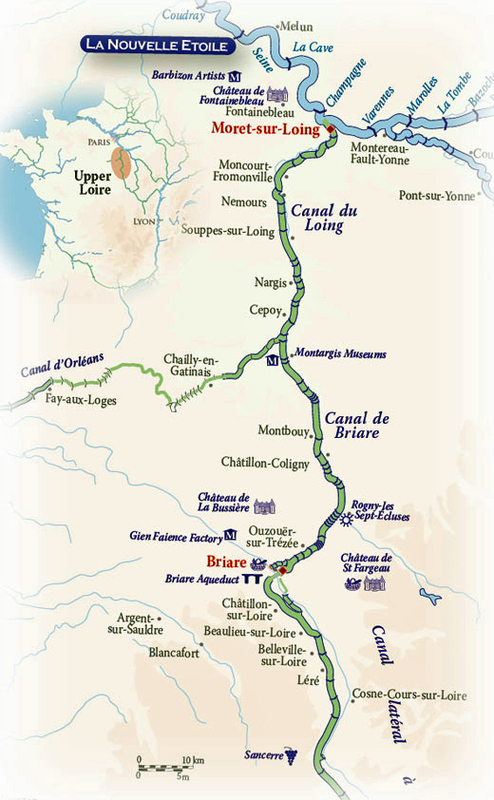 Today, continuing our cruise higher up the canal we reach Rogny-les-Sept-Ecluses. This "staircase" of seven locks was built in 1648 and is an impressive monument to the engineers of the past. After a relaxing lunch we take a short drive out to the beautiful town of Gien, on the banks of the River Loire, and is famous for its faïence earthenware. We also visit the International Hunting Museum at Chateau de Gien. Dinner on board. After passing through the locks of Rogny, we reach the highest point of the canal and start to descend slowly towards the River Loire. At Briare, we cross the river on the Pont Canal de Briare, designed and built by Gustav Eiffel in 1890. Later we drive to the Sancerre wine region to sample some of this delicious wine and perhaps taste some of the local Crottin de Chavignol cheese on our way back to the barge. Captain's Farewell Dinner on board. After breakfast, guests are transferred by private chauffeured minibus to their choice of location in Paris.